The Drive Low Bed Overbed Table is designed to fit specifically under low framed beds that have a 3.25 inch frame to floor clearance. 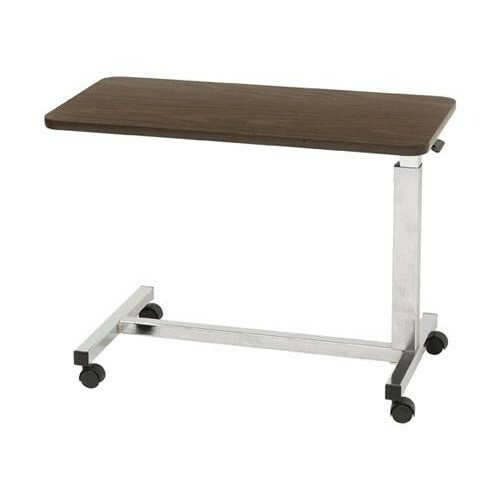 The Drive Medical 13081 Overbed Table tray has an attractive walnut woodgrain finish and can be adjusted to heights between 19.5 to 27.5 inches. This tabletop is easily raised with very little upward pressure. The durable frame is constructed with steel tubing and has a stylish chrome finish. It comes with swivel casters that allow it to be easily transported from room to room. This lightweight tray weighs 25 lbs and can support up to 100 lbs of weight. 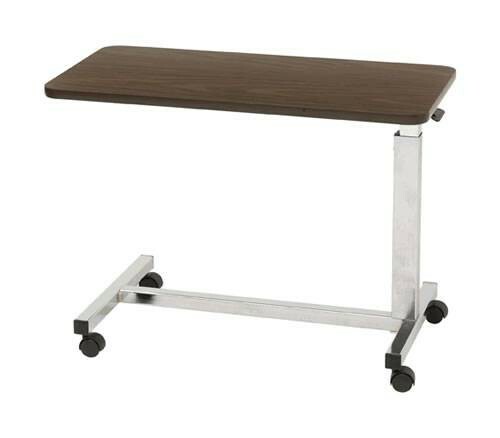 The tabletop measures 15 x 28 inches, the base measures 15 x 30 inches, and it comes with a limited lifetime warranty. Overbed Tables come in a variety of shapes and sizes with many features that help fit your needs. Find one at a discounted price that matches your needs at Vitality Medical today. what are the dimensions of the table top? The tabletop measures at 15 inches long and 30 inches wide.